As a busy wife and mom of two teenage boys, there is nothing I love more than looking forward to my next travel escape. I have always had a passion for travel and adventure and have been very fortunate to make that a intricate part of my life. We believe strongly in carving out as much time as possible to take family and couple trips (and, of course, I always throw in as many girls’ trips as possible!). The memories we create through travel are priceless and I am beyond excited to help others book their dream vacations and to help create those lifelong memories. I was born in Santa Rosa, California, and love to return to California wine country as much as possible. I have travelled to many locations around the world and I still consider Napa and Sonoma two of my favorite places to visit. The beauty of the countryside mixed with amazing wine and food is what travel is all about. I celebrated my 40th birthday in Napa with 12 of my girlfriends. 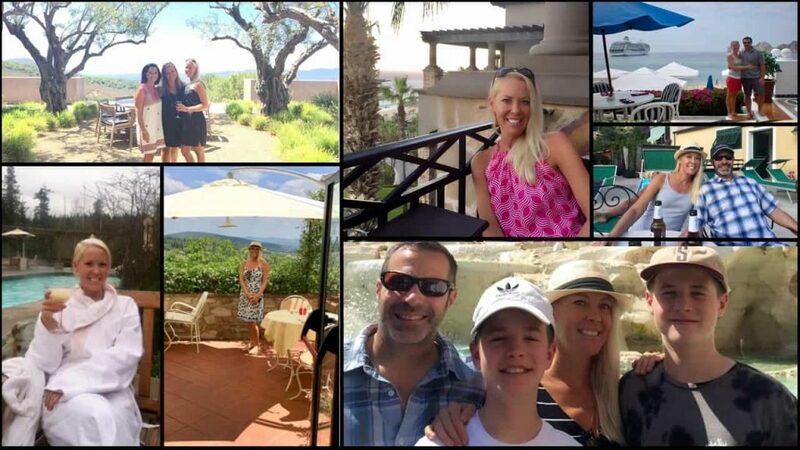 It was a magical trip filled with love, laughter, lots of wine and delicious food…a perfect trip! I moved to beautiful Seattle in 1980 and currently live in a very close knit neighborhood where we have met some of our best friends (with whom we travel with often). I graduated from Seattle University with a Social Work degree and worked in the mental health field for several years. My training and work experience in this profession continue to influence all aspects of my life. My ability to listen and problem solve are attributes that I can apply to my friendships, marriage, parenting and all business endeavors. I will listen to your wants and travel needs in order to create your next memorable holiday, however big or small. Not only do I love to travel, but I love the variety that each trip provides. We often travel with other families, we travel alone as a couple, and of course, travel as a family unit and/or with Grandparents. Each vacation and experience are unique and it is important to mix it up. Every May my husband and I head down to Cabo San Lucas, Mexico for a week and leave the kids with the grandparents! We also sneak up to The Four Seasons in Whistler, BC for our anniversary nearly every year. Time alone is essential and we love that reconnection! We also enjoy traveling with other couples…we just had the honor of visiting Havana, Cuba with 3 other couples for a friend’s special birthday. A trip of a lifetime to a incredible country. We also love to travel with close friends and their kids. Each year we take several ski trips, including local Washington resorts, as well as, Canadian resorts like Whistler, Silver Star and Sun Peaks. This past summer, we traveled through Europe with good friends…4 adults and 5 young teenagers. We visited Rome, Tuscany, Cinque Terre, and London. Exploring Europe with my teenage boys and our good friends was absolutely amazing. As a family, we love to visit Maui almost yearly. My youngest son’s first trip at 9 months old was to The Four Season’s in Wailea, Maui. What a great place to start! We also travel to San Diego every year to visit Grandparents. And, as I mentioned before, I love to getaway with my girlfriends. Quick trips to Beverly Hills, Orange County, Napa, or Vegas are always great, great fun! When at home in Seattle, I enjoy nothing more than spending time with my family and friends. I love to eat fabulous food, sip fine wine, and laugh as much as possible! I also love to volunteer in my community and I am very active with supporting our local public education. We also have a family cabin in the San Juan Island’s where we spend most of our Summers’ crabbing, fishing, whale watching and kayaking. I am so excited to embark on this next adventure of booking travel and look forward to assisting you in your next departure!! By far my favorite trip has been the one to Cuba. Amazing country, people and history. Also, traveling through Italy with my children was a beautiful experience. Traveling to Cabo with my husband each May is also a yearly highlight. Nice break from everything! I am also ALWAYS up for a trip to Napa, CA!